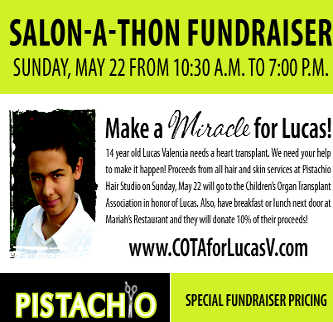 Pistachio Hair Studio is proud to announce its participation in an upcoming charity event to help Lucas Valencia, 14. Lucas is in need of a heart transplant and local volunteers aim to raise $50,000 to help with his surgical expenses. Lucas was born with hypertrophic cardiomyopathy a year ago and family, friends and Children’s Organ Transplant Association (COTA) have since been working to raise the funds for Valencia’s surgery. The funds will pay for additional non-insurance covered expenses related to the transplant that will cost about $500,000. To aid in this effort, Pistachio will be hosting its own charity drive by opening its doors on Sunday, May 22nd. The event will be offering hair services like cut and color applications, women’s and men’s hair cuts, as well as feather extensions. All proceeds will go towards Lucas’ transplant. The event will be held from 10:30am- 7pm on Sunday, May 22nd. Moreover, 10% of proceeds from Pistachio Fashion Boutique’s sales for the day will also go towards Lucas’s fund. Mariah’s Restaurant as well as Hendo’s Pizza and Pint’s will be donating a percentage of sales for the day to Lucas transplant. The community is teaming up to help support this needed cause. Come support a good cause and a boy who needs our community help. Please call Pistachio Hair Studio at 760.230.4880 to book your space.